Hotel Emma debuted in November of 2015. Set in the old Pearl Brewhouse built in 1894, the Hotel is named after Emma Koehler who ran the brewery after her husband and the Pearl President passed away in 1945. She was a clever and ingenious woman who kept the brewery afloat during Prohibition, focusing operations on dry cleaning and auto repair, as well as making beer, ice cream and soda. 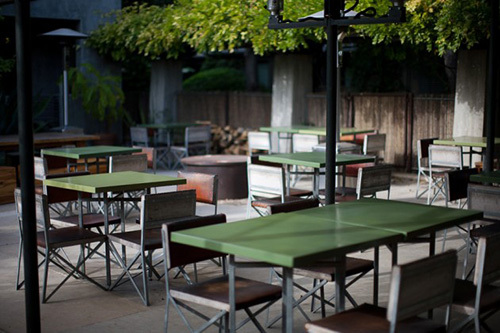 The renovated space incorporates the original industrial elements throughout the main areas of the hotel as well as the beautifully designed 145 rooms. I love any hotel with a book collection but this is an impressive, two story library with over 3700 titles, all acquired from Sherry Kafka Wanger. Her personal collection is a mix of literature, design, folk art, international business and children's stories to name a few. You can check out a book and return it before you leave. I know for a fact if I stayed here, I'd spend most of my time perusing the shelves and determining which book to take back to my room that night...or settling in to one of those leather chairs with a good read and a cocktail. 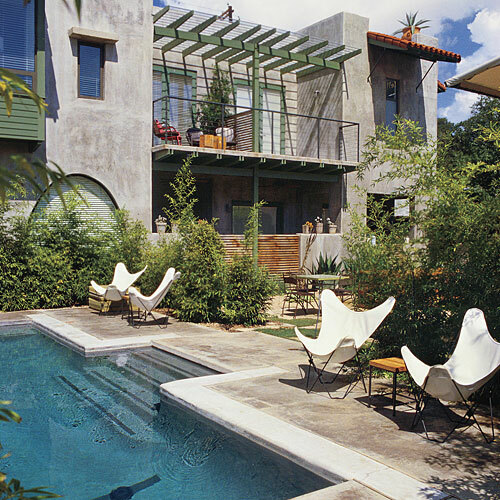 The New York design firm behind this massive renovation and undertaking is Roman and Williams, Clayton and Little Architects in Austin and Giles-Parscale of San Antonio. Rates begin at $325 a night. Learn more about Hotel Emma, here. Rebecca Rebouche is an artist based in southern Louisiana. Her paintings are playful, distinctive and deeply influenced by mother nature. 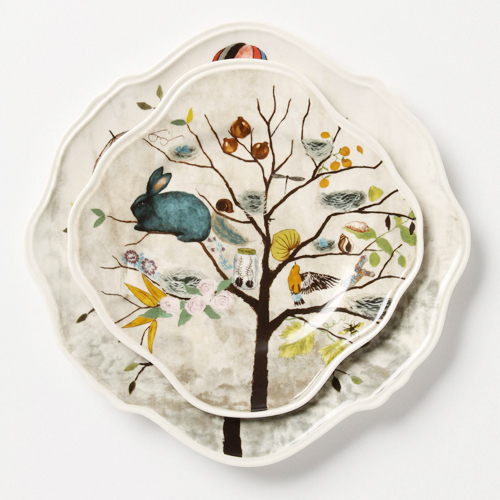 If you spend any time in Anthropologie, you'll see her work appear on bedding, scarves, bags, stationery, curtains, books and more. I'm personally in love with all her dinnerware. 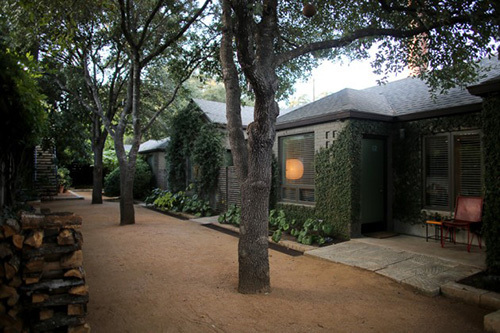 The loft is three stories, one bedroom, one and a half bath surrounded by trees and a little frog pond in the front. 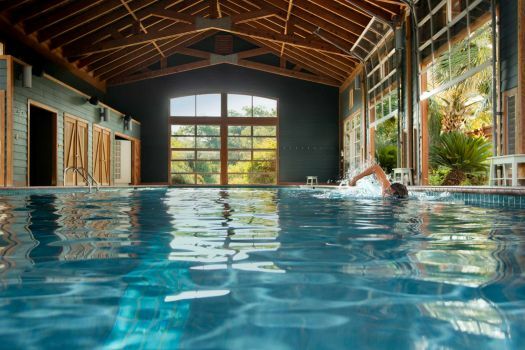 It's the perfect getaway spot where the stress falls away, replaced with balance and calm. As Rebecca shares, "My hope is that the house will play host to the great writers, artists, photographers, musicians, philosophers, architects, theorists, poets, actors and entrepreneurs of our time." The cabin rents for $165 a night. Book it here. A good hotel room is worth paying a little extra for but truth be told, some are better than others. 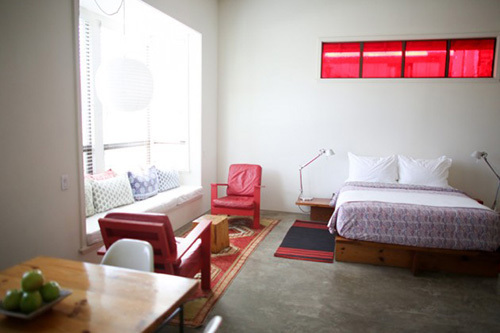 Like The Cell Block in Clifton, Texas- a two-cell jail from the 1930's converted into a one room, one bath boutique hotel, complete with a rooftop deck and two complimentary alcoholic libations upon arrival. This may just be the kind of solitary confinement you can handle. It's spacious, inviting, smartly designed and private- you can't help but feel safe and secure behind these doors. As an added touch, the resident record player spins prison related tunes only ... just think Johnny Cash and Elvis Presley. And like any good boutique hotel, The Cell Block has a cool shop of takeaways, like the Don't Drop Soap or the cooly designed matchboxes. It's good all around. 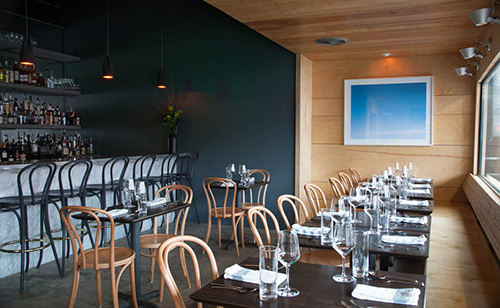 Book a trip to the stylish slammer, here. I love a good find so I was quite happy when I stumbled upon the website for the Dogfish Inn, a brand new brewery-themed boutique hotel. 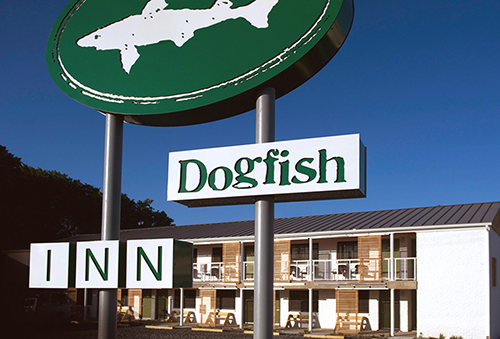 Situated in Lewes, Delaware, this design savvy Inn is an extension of the Dogfish Head Microbrewery and Brewpub. Founder of Dogfish Head craft brewed ales, Sam Calagione knew there was an opportunity to offer accommodations to all the travelers who passed through his popular microbrewery each year. When an old motel was up for sale last year in downtown Lewes, Sam renovated the property and gave it a new name. Situated on a pretty spot along coastal Delaware, the Dogfish Inn caters to those who like to get out and explore, without the need of a car. 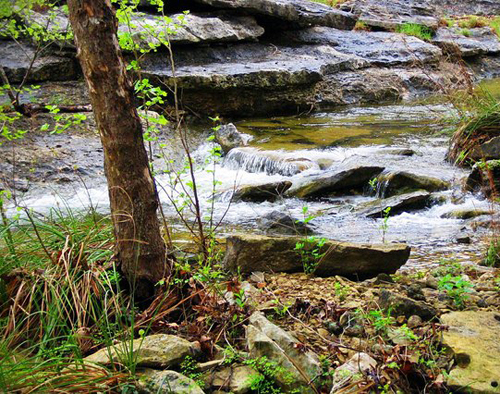 Here you can bike, hike, kayak or paddleboard...and drink craft beer. 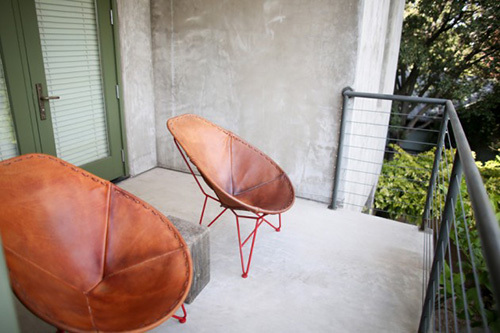 The modern furnishings are the best part of this hotel. Designed by Studio Tack of Brooklyn, this Inn has 16 dog friendly guest rooms that are minimal with just the right mix of added color and texture. 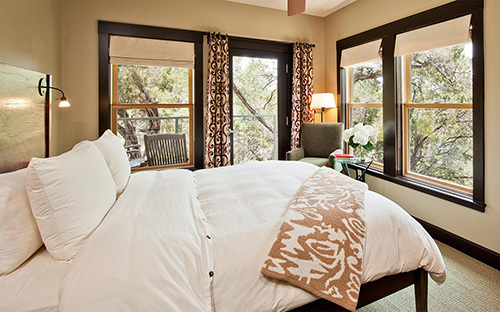 The bleached wood panels and flooring, plus the down feather pillows and comforter create a welcoming, cozy room. 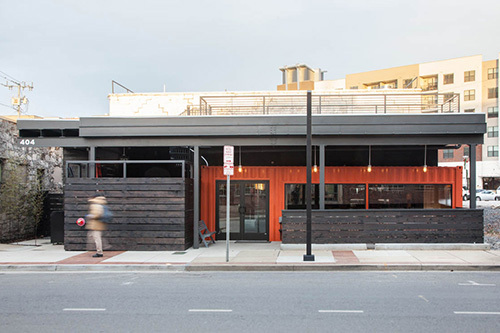 Plus, if you look closely, you'll discover fun beer-centric amenities and artwork. 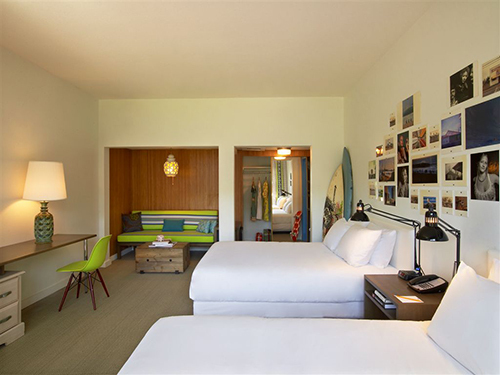 As stated on their site, "Each room includes a wool Dogfish blanket created in collaboration with the iconic apparel maker Woolrich. You'll also find a Tivoli radio and screenprints of beer labels from our music collaborations." Rooms are around $250 on weekdays, $280 on weekends. Steve Rogers is a local artist of Lewes and he has painted the historic Lightship Overfalls somewhere in each room- it's up to you to find it. The Lightship Overfalls is one of only 17 lightships remaining and is an historic landmark docked just a few hundred feet from the Inn. All of the artwork in each of the rooms is framed with salvaged wood from local farms, provided by Matt Myers, a local organic farmer. 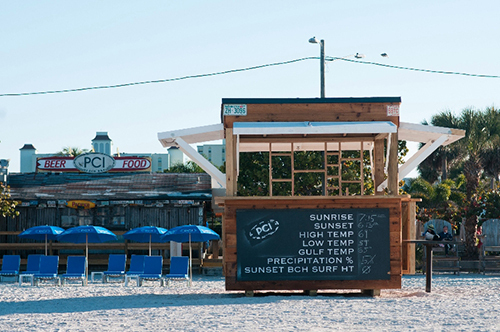 You'll also find retro-American made beach chairs and Apolis tote bags for any day trips to the local beaches- (the totes are custom designed to carry Dogfish Head's six packs back to your room). Plus they have a treasure map highlighting nearby favorites- which reminds me of the map and guide I produced for the city of Atlanta. I'm a nature girl. The more I'm outside, the better...plus, a little luxury never hurts. So it's safe to say this scene from the outdoor pool at the Travaasa Resort in Austin, Texas appeals to me. 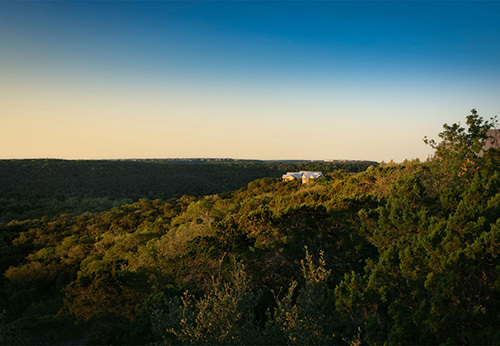 Travaasa is situated on 210 acres of the Balcones Canyonlands Preserve which overlooks Lake Travis. This destination proves to be a perfect resting ground for those looking for some relaxation or restoration time. 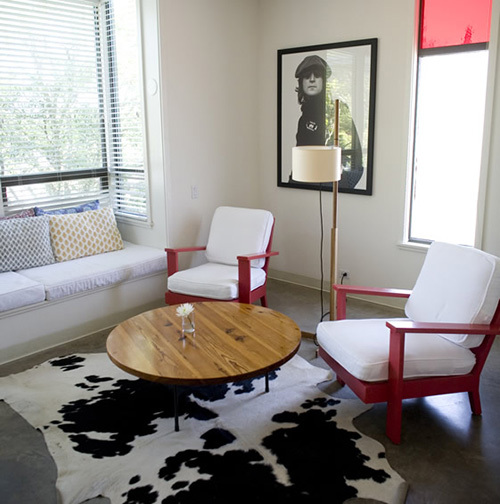 There are 70 guest rooms to choose from at Travaasa, each decorated in a simple Texas farmhouse style with lots of rich, earthy tones. 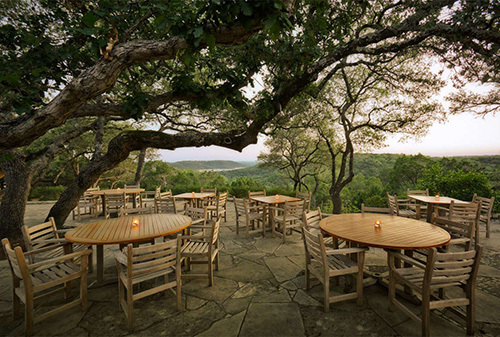 Each room has a private deck or patio to better immerse oneself in the Texas Hill Country. There are seven lodges of private rooms in all, connected by trail paths. 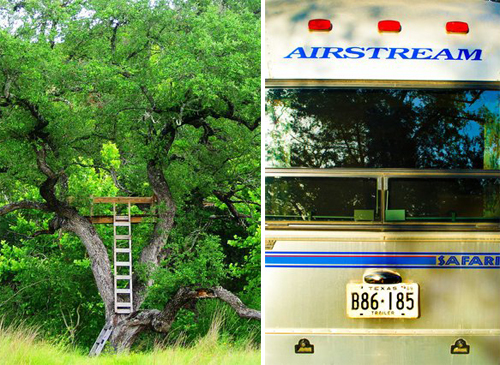 For the adventuring type, they have ziplining, Outward Bound climbing walls, horse stables, fitness and culinary classes, archery, campfires and guided hikes. Recently adding a farm to the grounds, they also offer hands-on classes in seed germination, plant identification, composting and how to raise chickens to name a few. If you like nature and aren't one to shy away from a bit of pampering and self indulgence, I think it's safe to say you'll like Travaasa too. Click here to learn more. 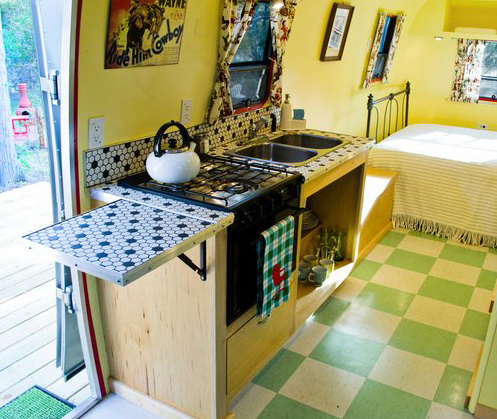 This incredible retro Airstream, nicknamed the Dixie Daisy accommodates two and is available for rent via Airbnb for just $110 a night.